The Brad Garrett Comedy Club features a mix of veteran and up and coming standup comics at the funnyman’s comedy club in The MGM Grand. 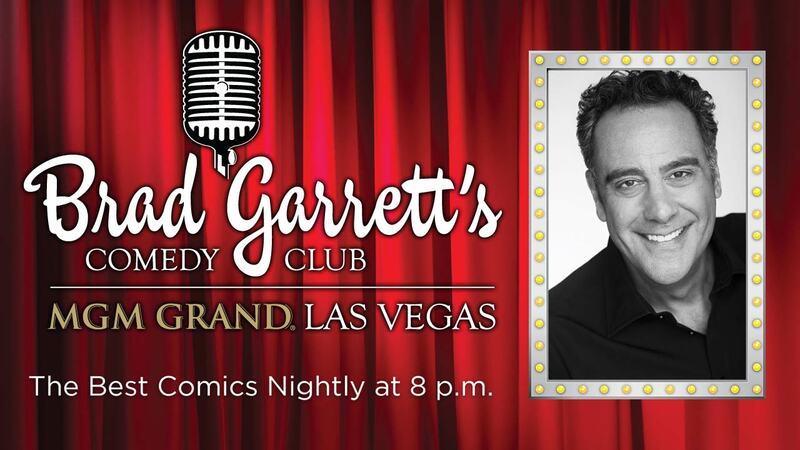 Brad Garrett’s Comedy Club at The MGM Grand has a cozy and intimate old school vibe that honors the long tradition of comedy icons who have performed in Las Vegas. Your current host, beloved Emmy winning actor and standup comedian Brad Garrett, looms even larger on the scene with his 6’8 stature. The beloved star got his comedic start at The Improv in Hollywood and appeared on Star Search. Before he caught his big break in the Emmy winning role of the down-trodden Robert Barone on Everybody Loves Raymond, he opened for Frank Sinatra in the old days of Vegas. Now Garrett is giving other comedians a chance to follow in his rather large footsteps, as fresh talent like Tim O’Rourke, Jeff Hartman or Bob Zany appear at the club, while Garrett headlines on a regular basis. The hands-on comedian often makes unscheduled visits and has been known to greet his guests at the door. Garrett cracks jokes about his physical dimensions and DNA, while making astute and funny observations about the relationships between men and women. A good portion of his act is improvised,and he puts on a different show every time, depending on the vibe of the audience as Garrett is a comedian who knows how to go with the flow. While the vibe at the club is old school, the comedy is edgy and modern. Garrett has been heavily influenced by Rodney Dangerfield, Don Rickles and Richard Pryor, but he’s also always on the search for new blood, as you’ll see by his diverse lineup of guest performers. Garrett’s club features a great blend of classic and cutting edge comedy styles. When you’re looking for the latest in laughs but want a nostalgic vibe, visit the Brad Garrett Comedy Club for an experience that mixes a classic vibe with an extremely modern sense of humor.